LoggerLink Mobile Apps—Data on the Go! Tips and Tricks: Who's NAN? 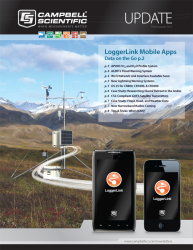 We're excited to announce the release of LoggerLink mobile apps. LoggerLink was designed to give you access to your IP-connected datalogger anywhere your mobile device has a data connection. We've developed two mobile apps—one that runs on iOS devices such as the iPad or iPhone, and another that runs on Android-based phones or tablets. LoggerLink packs a surprising number of features into a mobile application. You can view data tables, the Public table, or the datalogger's Status table in numerical or graphical format. The new apps let you collect data from the datalogger, and even email that data to your computer once it's collected. Using LoggerLink you can also set Public variables, toggle Boolean values, edit datalogger settings, and check and set the clock. You can send a new program to the datalogger, retrieve a program or other file from one of the datalogger's drives, pause a currently running program, and even make small program changes via a simple text editor. There's also a page that includes vital information on the health of the datalogger such as battery voltage, internal temperature, operating system version, and program errors. To see some of these features in action, check out our LoggerLink video tutorial on YouTube. LoggerLink supports our newest generation of PakBus dataloggers—the CR1000, CR3000, CR800 series, and CR200 series. For LoggerLink version 1, the datalogger must be available via an IP connection, such as an NL100, NL115, NL120, NL200, or cellular modem. The apps support PakBus routing to dataloggers that may not be connected to IP directly, but their neighboring datalogger is. For iOS only, LoggerLink also supports a walk-up-and-connect ad hoc connection using a WiFi RS-232 dongle. LoggerLink for iOS supports devices running iOS version 4.2 and greater. LoggerLink for Android supports devices running Android version 2.2 and greater. The apps are available through the Apple App Store or Google Play. We think you'll find a lot to like in our mobile apps. Why carry around a phone, PDA, and laptop computer? With LoggerLink you'll have the convenience of carrying one device that can be used for managing your datalogger as well as managing your life. And because we offer support for two popular mobile operating systems, you choose the platform—and the device. Whether you prefer the versatility of a tablet or the portability of a smart phone in your pocket, you'll be able to get your data—on the go!